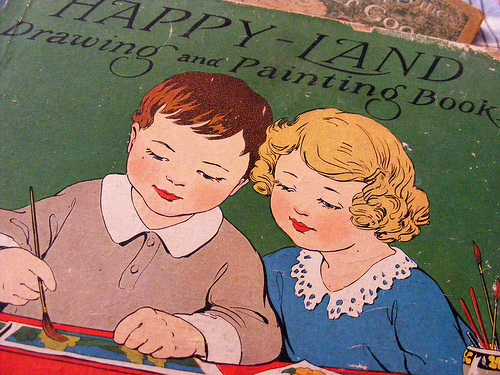 Image: Photograph of 1923 “Happy-Land Drawing and Painting” book cover showing two children painting together. I was recently talking to someone about multiplayer games because she was in the process of developing a game that she initially thought could just as well be done as a single player educational game. However, the real issue was what multiplayer really meant. 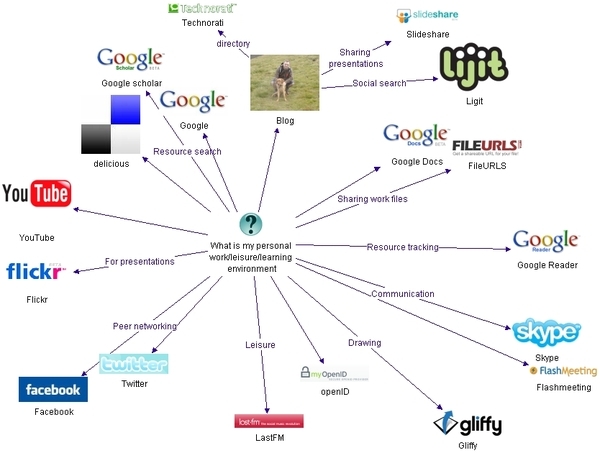 I have previously put forth the idea of Big OER versus little oer. There is similarly multiplayer and Multiplayer. Some incredibly popular games are really multiplayer. In a multiplayer game, multiple people occupy the same space simultaneously, but the environment or the game does not foster cooperation or teamwork. It may even be the case that what those other players do does not affect you at all directly. A good example of this is Zynga’s Farmville. In Farmville, you have your farm, you plant your crops, and you buy whatever the nifty thing of the day is. You can interact with your neighbours or your friends, but it is not required or necessary to progress through all the content of the game. Another example that came to mind was GuildWars. It sounds like you should be forming guilds and interacting with other people, but for many people it was initially very much a solo game. The game even supported solo play by allowing you to hire NPC mercenaries to go on missions with you. Contrast this with true Multiplayer games where you do significantly better if you cooperate and group with other people or where the entire premise of the game is based around small communities of people. 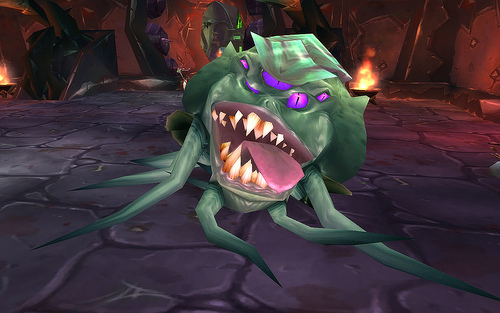 For example, in World of Warcraft, most of the content is not accessible to solo players. Solo players can complete independent quests, but good rewards, in the form of better gear, are available from five-, ten-, or twenty-five player instances. In those scenarios, what you do does affect other people and they are often not afraid to let you know it. If you fail to play well or appropriately, if you are in a random group of people—called a “pick up group” or PUG—they may kick you out of the group or verbally abuse you or both. Extremely difficult content is hard to play in a pick-up group. It has been developed for cohesive groups of people, where the people are used to playing together either because they are all in a community together, like a guild, or because they are a regular cohort of players in a raiding group. Each player in a group in one of these larger adventures is important. Each person has a role to play. Each person can contribute to deciding how the encounters are going to turn out by their skill or their tactics. Image: The blurred boundary between the Stranglethorn Vale, Duskwood, and Deadwind Pass zones in World of Warcraft. The above is an extract from a Twitter conversation I had on October 1st during the Future of Technology in Education conference (#fote10) with @_arien. Arien was attending the conference, watching Ollie Bray’s talk, while I was following the conference on Twitter. Arien, as it happens, is one of my Open University H810 students. Ollie Bray (@olliebray), of Learning & Teaching Scotland, was discussing the use of computer games in education. I think Arien’s hit the nail on the head: it is about context. One of the reasons game skills don’t transfer to learning well is because learners/players do not see something in a game as being applicable to something academic. Much learning we do is completely context-based. Without the context of the “subject”, we do not necessarily think to apply something we have learned or maybe even realize that it is applicable.